About this Dade Short Sleeve Polo by TRIMARK - Mens:The versatile Dade Polo has a classic look that never goes out of style.Available in nine colors, it offers great performance at a great price, with breathable fabric, a wicking finish, UV protection, snag-resistance and wash-and-wear convenience.The mens version features a three-button placket with dyed-to-match buttons, while the womens has a five-button placket, as well as shaped seams and a tapered waist for a flattering fit. About this Dade Short Sleeve Polo by TRIMARK - Womens:The versatile Dade Polo has a classic look that never goes out of style.Available in nine colors, it offers great performance at a great price, with breathable fabric, a wicking finish, UV protection, snag-resistance and wash-and-wear convenience.The mens version features a three-button placket with dyed-to-match buttons, while the womens has a five-button placket, as well as shaped seams and a tapered waist for a flattering fit. About this Ash City - Core 365 Mens Origin Performance Piqu Polo:100% polyester pique, 4.1 oz./yd2/140 gsm. Moisture wicking, antimicrobial and UV protection performance.Special Instructions:If ordering less than minimum requirements additional fees will apply. About this Adjustable Full Length Apron with Pockets:This adjustable apron provides full length coverage while in the kitchen. The easily adjustable neck strap enables a comfortable fit while the 90% polyester and 10% cotton blend provide a soft easy to care for fabric. The apron also provides ample storage with a large front pocket and a loop for utensils. Material: Cotton/Polyester Blend.Special Instructions:Other imprint methods/areas may be available; please call for details. Please note that product images may not depict the standard imprint method included in pricing. About this 100 Cotton Full Length Apron:This 100% cotton apron provides full length coverage while in the kitchen. It features a large front pocket for storage. Material: 100% Cotton.Special Instructions:Other imprint methods/areas may be available; please call for details. Please note that product images may not depict the standard imprint method included in pricing. About this Reflective Safety Vest:One Size Fits Most.Zippered Pouch.Made Of 190T Nylon With 2 Hook And Loop Closures.Special Instructions:Rush Service:Catalog Quantities Only.One Color And One Location. 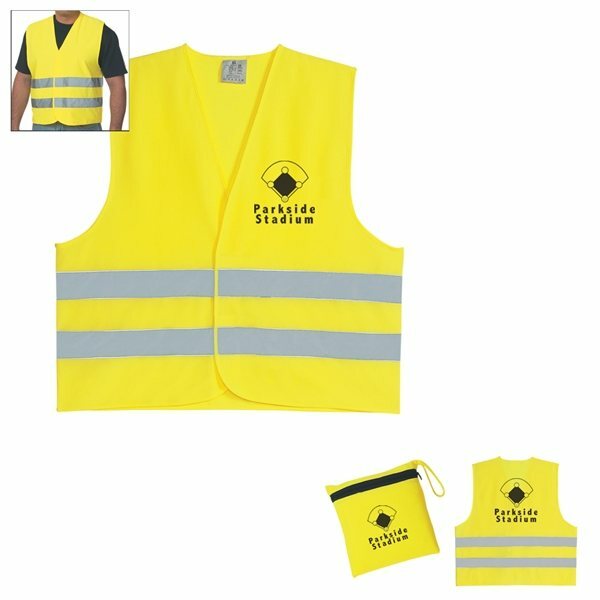 About this The Safety Vest:Neon yellow safety vest with reflective stripes.Material: Polyester.Special Instructions:1 Day Rush, available upon request for 1 color, 1 imprint location orders. About this Crandall Short Sleeve Polo by TRIMARK - Mens:The Crandall Short Sleeve Polo is a Polyester Cotton blend pique knit with a 3-button placket, dyed-to-match buttons, flat knit collar and sleeve cuffs and other well-constructed features.Crandall has Caretech properties for an easy wash and wear with low shrinkage, fade resistant, commercial laundry wash and up to 5XL sizes.Available in eleven trendy colors, this versatile polo is the perfect canvas for your branding.Fabric 65% Polyester 35% Cotton pique knit, 200 g/m2 (5.9 oz/yd2). 65% Polyester 35% Cotton flat knit collar and sleeve cuffs. About this Wilshire Long Sleeve Shirt by TRIMARK - Womens:The Wilshire is a classic woven thats perfect as part of a work uniform.Available in both mens and womens styles, the durable Wilshire is designed for heavy wear.The mens style features a left-chest pocket and center-back box pleat, while the womens style has shaped seams and a tapered waist for a more flattering fit.With its decoration-friendly design and wide range of color options, the Wilshire projects a stylish, professional look for any industry.Fabric: 65% Polyester 35% Combed cotton woven twill.145 g/m2 (4.3 oz/yd2). About this Crandall Short Sleeve Polo by TRIMARK - Womens:The Crandall Short Sleeve Polo is a Polyester Cotton blend pique knit with a 4-button placket, dyed-to-match buttons, flat knit collar and sleeve cuffs and other well-constructed features.Crandall has Caretech properties for an easy care wash and wear with low shrinkage, fade resistant and commercial laundry wash.Available in eleven trendy colors, this versatile polo is the perfect canvas for your branding.65% Polyester 35% Cotton pique knit, 200 g/m2 (5.9 oz/yd2). 65% Polyester 35% Cotton flat knit collar and sleeve cuffs. About this Belmont Short Sleeve Polo by TRIMARK - Mens:The Belmont Polo is made with 100% cotton, giving it an exceptionally soft feel for all-day comfort.Available in men's and women's, it's got a placket with dyed-to-match buttons, V-notch side slits, a flat knit collar and flat knit sleeve cuffs.With eight colors to choose from, the Belmont is a stylish choice for an employee uniform.Fabric 100% Combed cotton pique knit.200 g, m2 (5.9 oz, yd2) SOLID COLORS 85% Combed cotton 15% Polyester pique knit.200 g, m2 (5.9 oz, yd2) HEATHER COLORS CONTRAST:100% Combed cotton flat knit collar and sleeve cuffs. About this Wilshire Long Sleeve Shirt by TRIMARK - Mens:The Wilshire is a classic woven thats perfect as part of a work uniform.Available in both mens and womens styles, the durable Wilshire is designed for heavy wear.The mens style features a left-chest pocket and center-back box pleat, while the womens style has shaped seams and a tapered waist for a more flattering fit.With its decoration-friendly design and wide range of color options, the Wilshire projects a stylish, professional look for any industry.Fabric: 65% Polyester 35% Combed cotton woven twill.145 g/m2 (4.3 oz/yd2). About this Macta Short Sleeve Polo by TRIMARK - Mens:The first thing you notice about the Macta Polo is the contrast detail on the placket that highlights the contrast stitching on the style lines.Look a little closer, and youll note details like the self-fabric collar, contrast inner neck tape and contrast under collar.While the mens has a three button placket with dyed-to-match buttons, the womens has a five-button placket, plus a dropped back hem and tapered waist for a flattering fit.Both include a reflective Elevate logo on the rear right hip. About this W - Sagano Short Sleeve Polo:The lightweight Sagano Polo uses trendy textured heather blocking to create a subtle yet striking retail look.Along with contrast coverstitch and V-notch side slits, the Saganos antimicrobial fabric offers exceptional technical features, including breathability, moisture wicking, snag-resistance and UV protection.Fabric1: 100% Micro polyester slub jersey knit with anti-microbial and wicking finish. 135 g/m2 (4 oz/yd2)CONTRAST: 100% Micro polyester jersey knit with anti-microbial and wicking finish. 150 g/m2 (4.4 oz/yd2). About this M - Cromwell Long Sleeve Shirt:The Cromwell Long Sleeve Shirt brings style and sophistication to the upscale classic executive look.Available in four colors, its perfect for the office & everyday wear, with an iron free fabrication and finish.This versatile hidden button down is a great look for employees at corporations, small businesses, schools and universities.Fabric: 100% Cotton 80’s 2-ply pinpoint oxford woven with iron free finish. 110 g/m2 (3.2 oz/yd2) CONTRAST: 100% Cotton yarn dyed stripe with iron free finish inner collar stand, inner yoke, inner sleeve cuffs and inner sleeve placket. About this 100 Cotton Apron:Made Of 100% Cotton.Large Front Pocket.Adjustable Tie Strap. About this Belmont Short Sleeve Polo by TRIMARK - Womens:The Belmont Polo is made with 100% cotton, giving it an exceptionally soft feel for all-day comfort.Available in men's and women's, it's got a placket with dyed-to-match buttons, V-notch side slits, a flat knit collar and flat knit sleeve cuffs.With eight colors to choose from, the Belmont is a stylish choice for an employee uniform.Fabric 100% Combed cotton pique knit.200 g, m2 (5.9 oz, yd2) SOLID COLORS 85% Combed cotton 15% Polyester pique knit.200 g, m2 (5.9 oz, yd2) HEATHER COLORS CONTRAST:100% Combed cotton flat knit collar and sleeve cuffs. About this M - Sagano Short Sleeve Polo:The lightweight Sagano Polo uses trendy textured heather blocking to create a subtle yet striking retail look.Along with contrast coverstitch and V-notch side slits, the Saganos antimicrobial fabric offers exceptional technical features, including breathability, moisture wicking, snag-resistance and UV protection.Fabric1: 100% Micro polyester slub jersey knit with anti-microbial and wicking finish. 135 g/m2 (4 oz/yd2)CONTRAST: 100% Micro polyester jersey knit with anti-microbial and wicking finish. 150 g/m2 (4.4 oz/yd2). About this Apron:Apron with pocket and adjustable neck clasp. Materials: 100% CottonSpecial Instructions:Rush Service:The standard imprint method, 1-color/ 1-location is available. About this Stirling Short Sleeve Shirt by TRIMARK - Mens:The Stirling brings style and durability to the classic work shirt.Available in both mens and womens styles, this short sleeve woven is designed for heavy wear.The mens style features a left-chest pocket and center-back box pleat, while the womens style has shaped seams and a tapered waist for a more flattering fit.With its decoration-friendly design and wide range of color options, the versatile Stirling is a sharp look for any industry.Fabric: 65% Polyester 35% Combed cotton woven twill.145 g/m2 (4.3 oz/yd2). About this Stirling Short Sleeve Shirt by TRIMARK - Womens:The Stirling brings style and durability to the classic work shirt.Available in both mens and womens styles, this short sleeve woven is designed for heavy wear.The mens style features a left-chest pocket and center-back box pleat, while the womens style has shaped seams and a tapered waist for a more flattering fit.With its decoration-friendly design and wide range of color options, the versatile Stirling is a sharp look for any industry.Fabric: 65% Polyester 35% Combed cotton woven twill.145 g/m2 (4.3 oz/yd2). About this M - Mack Short Sleeve Polo:The lightweight Mack Polo creates a bold colorblock look, pairing steel grey with black, red, blue or white.Along with the retail style the Mack offers exceptional technical features, including breathability, moisture wicking, snag resistance and UV protection.Fabric: 100% Polyester textured knit with wicking finish. 155 g/m2 (4.6 oz/yd2) CONTRAST: 100% Polyester flat knit collar. About this W - Mack Short Sleeve Polo:The lightweight Mack Polo creates a bold colorblock look, pairing steel grey with black, red, blue or white.Along with the retail style the Mack offers exceptional technical features, including breathability, moisture wicking, snag resistance and UV protection.Fabric: 100% Polyester textured knit with wicking finish. 155 g/m2 (4.6 oz/yd2) CONTRAST: 100% Polyester flat knit collar. About this M - Colter Short Sleeve Shirt:The Colter Short Sleeve Shirt is living proof that casual and professional can come together in one sharp look.This poly-cotton blend features an upper patch pocket on the mens, narrow twin needle topstitch detail, flattering fit on the womens and comes in a variety of stylish colors. Fabric: 65% Polyester 35% Cotton poplin. 110 g/m2 (3.2 oz/yd2). About this W - Cromwell Long Sleeve Shirt:The Cromwell Long Sleeve Shirt brings style and sophistication to the upscale classic executive look.Available in four colors, its perfect for the office & everyday wear, with an iron free fabrication and finish.This versatile hidden button down is a great look for employees at corporations, small businesses, schools and universities.Fabric: 100% Cotton 80’s 2-ply pinpoint oxford woven with iron free finish. 110 g/m2 (3.2 oz/yd2) CONTRAST: 100% Cotton yarn dyed stripe with iron free finish inner collar stand, inner yoke, inner sleeve cuffs and inner sleeve placket. About this Non - Woven Apron:Made from 80 GSM non-woven polypropylene material. Features a neck strap, adjustable tie waist straps and two 6" H x 6" W connected front pockets for convenient storing of necessities.Special Instructions:Rush service: 1-color/1-position required. Item color assortments are not available. About this Cotton Cooking Apron:Made Of 100% Cotton.Large Front Pocket.35" Tie Straps. About this 100 Cotton Canvas Apron:Made from 100% cotton fabric ( 150 GSM). Features neck strap, adjustable tie waist straps and a 5" H x 6" W front pocket for convenient storing of necessities.Special Instructions:Rush service: 1-color/1-position required. Item color assortments are not available. About this Gildan 6 oz DryBlend 50/50 Jersey Polo:Gildan 6 oz. DryBlend 50/50 Jersey Polo - Preshrunk 50% Cotton/50% Polyester Jersey Knit.6 oz.DryBlend® Technology Delivers Moisture-Wicking Properties.Contoured Welt Collar And Cuffs.3 Wood-Tone Buttons On A Clean-Finished Placket With Reinforced Bottom Box.Double-Needle Bottom Hem.Quarter-Turned To Eliminate Center Crease.Heat Transfer Label.Machine wash warm, inside out, with like colors. Only non-chlorine. bleach. Tumble dry medium. Do not iron. Do not dry clean..Special Instructions:Multicolor imprint is available, Please call for service. About this Gourmet Apron With Pockets - Dark Colors:55% cotton/45% polyester 7.5 oz twill fabric. Two waist-level front pockets with 1" wide adjustable neck strap. 24" waist ties. NOTE: Product comes with Prop 65 warning label. Label reads: "WARNING: This product may contain carcinogen, which is known to the State of California to cause Cancer and Reproductive Harm. For more information, go to www.P65Warnings.ca.gov. Special Instructions:Rush : 1. Catalog quantities only.2. Valid only for the standard number of imprint colors/positions included for each item. Thank you Edgar and Kelsey! The Custom Port Authority Silk Touch Polo Shirt is high-quality and anything but ordinary. It’s one of the main reasons why this polo is on our Top 100 promotional items. Your team will love these as an incentive. Our customer service team is standing by now to help you. With superior wrinkle and shrink resistance, a silky soft hand and an incredible range of styles, sizes and colors, the Custom Port Authority Pique Knit Polo Shirt is the first-rate choice for uniting just about any group. The Custom Port Authority Pique Knit Polo Shirt features flat knit collar and cuffs. Feeling good about this product? You should! Order today! Thank you for your review Rachel, it’s reviews like yours that we always strive for. We know the Custom Port Authority Ladies Pique Knit Polo Shirt is a hit at fundraisers, tradeshows, and offices. Women won’t have to set aside fashion with this trendy polo shirt. You can guarantee that polo shirts never go out of style. With this professional polo shirt on our “Top 100”, you can accomplish both the professional and casual look. 7-ounce, 100% ring spun combed cotton heavyweight pique (preshrunk). Don’t knit your way out of this one, shop now! Our Top-Quality product is across the board for every product on our website, and our style of imprinting always compliments our products! We make sure that each product comes out exactly the way you want it. Made Of 190T Nylon With 2 Hook And Loop Closures. Our customer service team is standing by ready to help you. Order online here! With over 900 promotional business wear available in our selection, you’ll be sure to find the professional attire your company needs! From polos to aprons, we offer a variety of business wear your company will love. You no longer need to look elsewhere with the variety of options we have. Be the trendsetter of your company, search your business wear here! Our personalized apparel and business wear are designed for performance and fashion to keep brand fans thanking you for years to come. Every polo, cobbler apron and short sleeve oxford is specially priced and professionally imprinted to vividly promote your brand. Let’s make marketing make cents! Search our site for a wide selection of promotional apparel and business wear. Check out even more cool apparel and business wear on sale now! Take a peek at our fashionable and comfortable selection of promotional apparel and business wear currently available. We’re ready to help expedite your order, so give us a call! Choose from even more cool business wear and more! Our selection will allow your company to be on top of the hottest trends. With our fast and easy to use website, you’ll have your order in no time! From Hanes to Port Authority, we have what you’re looking for. Allow your team to work it in their new business wear.